Florence Nightingale, (12 May 1820 – 13 August 1910) was a celebrated British social reformer and statistician, and the founder of modern nursing. She came to prominence while serving as a nurse during the Crimean War, where she tended to wounded soldiers. She was known as "The Lady with the Lamp" after her habit of making rounds at night. In 1860, Nightingale laid the foundation of professional nursing with the establishment of her nursing school at St Thomas' Hospital in London. It was the first secular nursing school in the world, now part of King's College London. The Nightingale Pledge taken by new nurses was named in her honour, and the annual International Nurses Day is celebrated around the world on her birthday. The first official nurses' training programme, the Nightingale School for Nurses, opened in 1860. The mission of the school was to train nurses to work in hospitals, to work with the poor and to teach. This intended that students cared for people in their homes, an appreciation that is still advancing in reputation and professional opportunity for nurses today. 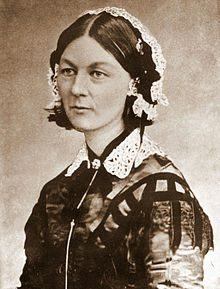 The Florence Nightingale Declaration Campaign,established by nursing leaders throughout the world through the Nightingale Initiative for Global Health (NIGH), aims to build a global grassroots movement to achieve two United Nations Resolutions for adoption by the UN General Assembly of 2008. They will declare: The International Year of the Nurse–2010 (the centennial of Nightingale's death); The UN Decade for a Healthy World–2011 to 2020 (the bicentennial of Nightingale's birth). NIGH also works to rekindle awareness about the important issues highlighted by Florence Nightingale, such as preventive medicine and holistic health. So far, the Florence Nightingale Declaration has been signed by over 18,500 signatories from 86 countries. The President of India honours nursing professionals with the "National Florence Nightingale Award" every year on the occasion of International Nurses Day on 12 May. The award, established in 1973, is given in recognition of meritorious services of nursing professionals characterized by devotion, sincerity, dedication and compassion.